Whether you already have hearing loss or want to save what you have, it's time to look into bone conduction earphones. Well, guess what! These True Wireless Bone Conduction Earphones are on sale and a great introduction to the tech. If you're not familiar with bone conduction, you'll notice something different about these otherwise minimalist gadgets: No earbud. That's because the headphones sit outside of the ear, transmitting sound through the bones of the skull in a way that completely bypasses the eardrum while still delivering crisp stereo sound. Lightweight and unobtrusive, they're also equipped with 4.2 Bluetooth wireless technology and a one-touch home button that lets you answer calls or switch music tracks quickly and easily. They juice up in just two hours and can last up to 10 hours on a single charge, making them your new traveling companion no matter where you need sound. 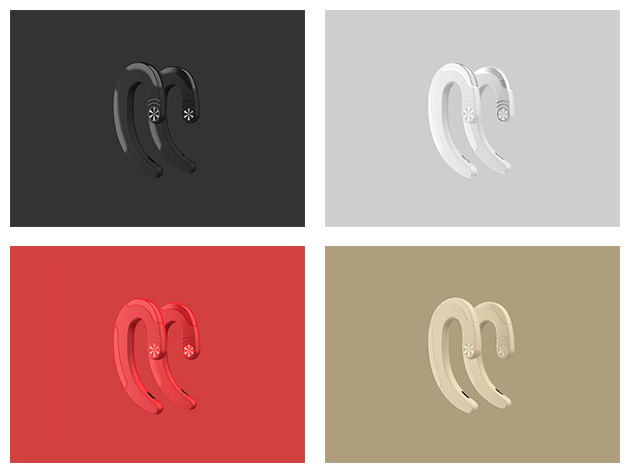 Pick up the True Wireless Bone Conduction Earphones today at a 20% discounted price of $39.99.